BBC Radio 5Live have launched a brand new weekly cricket podcast called 'The Doosra'. The show, also broadcast on 5Live, features former World Cup winner Isa Guha, BBC Broadcaster Ankur Desai and of course award-winning stand-up comedian Aatif Nawaz. The Doosra is available on all major podcast providers or by clicking here. Instant GrAATIFication: Tickets on sale now! In August 2018, Aatif Nawaz brings his brand new solo comedy show to the Edinburgh Fringe Festival. Instant GrAATIFication is Aatif's 4th solo show and will be performed at The Stand Comedy Club from the 3rd to the 26th of August. Tickets are on sale now and can be booked by clicking here. Aatif Nawaz will be reprising his role as Raj King in the forthcoming 13th episode of the popular Cornershop Web-Series. The teaser trailer can be viewed by clicking here. Aatif will be joining Guerilla Cricket's team of broadcasters for the forthcoming historic test match between Ireland and Pakistan. It is Ireland's first test match and Guerilla Cricket, as official partners of Cricket Ireland, will be broadcasting live from the 11th to the 15th of May 2018 from Malahide. Aatif will be part of the broadcast on Saturday the 12th and Sunday the 13th of May. You can listen to live, ball-by-ball coverage of all the action on GuerillaCricket.com. Aatif Nawaz will be performing at the Desi Central Comedy Show on Friday the 11th of May at the Harrow Art's Centre in London. The line-up also includes Prince Abdi, Inder Manocha, Eshaan Akbar and Emily Lloyd-Saini. Tickets can be found by clicking here. From Tuesday the 17th of April 2018, Aatif Nawaz will begin hosting a weekly radio show on LRB Digital called 'Good Things...with Aatif Nawaz'. The show will be a break from the doom and gloom of day to day news and feature only positive and light-hearted news stories from around the world. LRB Digital is broadcast both online and on DAB Radio in the UK. In April, Aatif hosted a series of Q&A sessions with Pakistani cricket legend Younis Khan in aid of the British charity Read Foundation. The shows in London, Manchester and Birmingham were a huge success and a big thank you to everyone who pledged to support this incredible organisation. Following an overwhelming response to his Maltese debut, Aatif Nawaz will return to Malta for another comedy show hosted by Maltese Funny Business. The show will also feature Jimmy Carter, Dave O'Dwyer and Paul Pennington and takes place at Talbot & Bons in Luqa on the 23rd of February 2018. More information can be found on Maltese Funny Business' Facebook page. Aatif Nawaz will be debuting his brand new stand-up comedy show AATIFLIX at the 2018 Edinburgh Festival Fringe. The follow up to Muslims Do It 5 Times A Day, AATIFicial Intelligence and The Last Laugh will focus on social media and it's increasing dominance of our psyche. 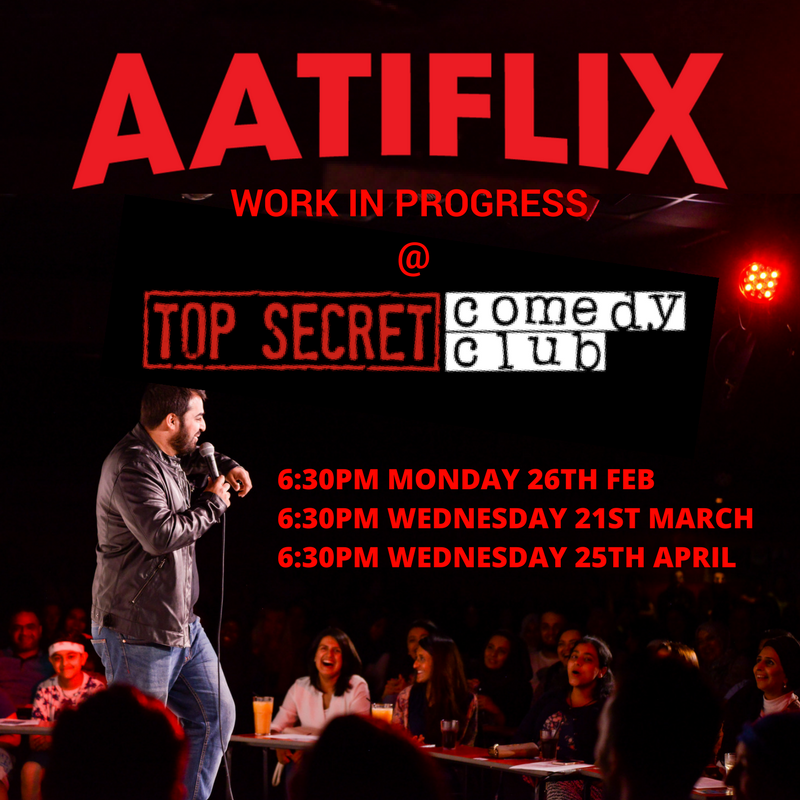 Prior to it's debut, Aatif will be performing a work-in-progress of the show at London's iconic Top Secret Comedy Club on the 26th of February, the 21st of March and the 25th of April. Tickets are available now on Top Secret Comedy Club's website. On Friday the 26th of January 2018, for the very first time, Aatif will be performing in Malta. The comedy show will also feature Jimmy Carter, Paul Pennington and Special Guests. Ticket information can be found on the Maltese Funny Business website. 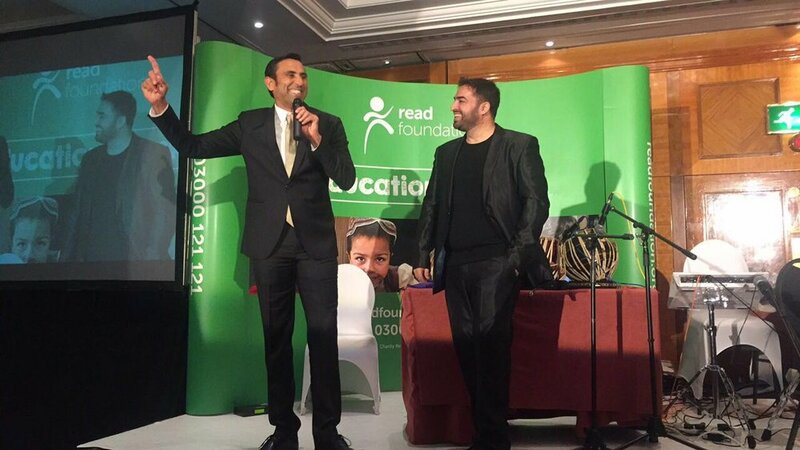 The Human Appeal Comedy Tour 2017 was a huge success, with sell out crowds across 16 cities. As part of the tour, Aatif recorded 2 episodes on AATIFicial Diaries as well as a brand new show call AATIFicial Conversations. All of the videos featuring Jeremy Mclellan, Ali Official, Prince Abdi, Nabil Abdulrashid, Preacher Moss and Bilal Zafar can be found on Aatif's Official Youtube Channel and Facebook page. For the 2nd year running, Aatif will be hosting the Human Appeal UK Comedy Tour. The 2017 edition, the tour will take in 16 cities for 16 shows featuring performances from Nabil Abdulrashid, Ali Official, Bilal Zafar, Prince Abdi, Preacher Moss, Jeremy McLellan and of course Aatif Nawaz. Click here for tickets and information. The latest entry in the AATIFicial Diaries series is online now. Subscribe to Aatif's Official YouTube Channel to never miss a video. Aatif @ Top Secret London...again. On Sunday the 26th of November 2017, Aatif will be returning to Top Secret Comedy Club in London. Also performing are Ben Van Der Velde, Nico Yearwood and Jake Lambert. You can book tickets by clicking here. The latest in Aatif's series of Vlogs is online now. Subscribe to Aatif's YouTube channel to never miss an update. On Wednesday the 1st of November 2017, Aatif will return to Top Secret Comedy Club in London. The show will also feature comedy stars Jamali Maddix, John Hastings, Nigel Ng, Tim Renkow and Dave Green. Tickets can be bought by clicking here. In the latest episode of AATIFicial Diaries, Aatif visits FRIENDS Fest in London, celebrating the iconic sitcom TV series. Be sure to subscribe to Aatif's YouTube channel to stay up to date on all his adventures. On Monday the 23rd of October, Aatif Nawaz will be performing at the Top Secret Comedy Club in London. Also on the line-up are Alistair Williams, Inder Manocha and George Rigden. You can book tickets by clicking here. 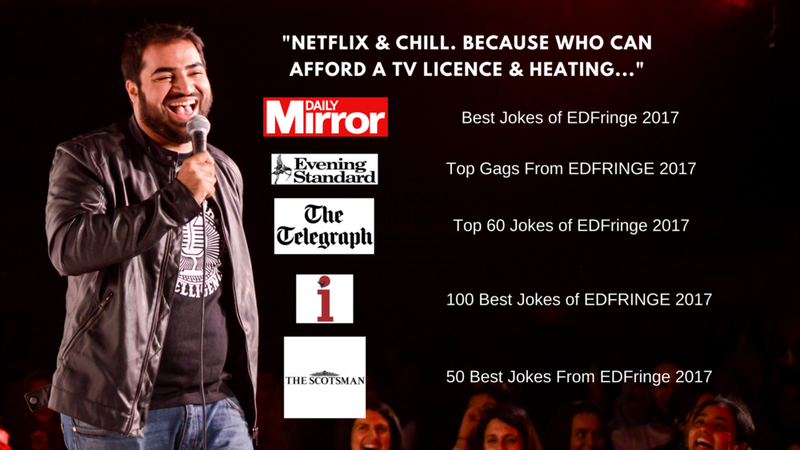 As well as entertaining late night audiences and earning strong reviews, Aatif's show The Last Laugh has spawned jokes included in numerous compilations of the best jokes at the 2017 Edinburgh Fringe Festival. Watch Aatif's VLOG from the Fringe by clicking here, or read his perfect playlist by clicking here.